One of the most common customer requests we receive is the ability to reset your passphrase without losing your content and contacts. With the new recovery keys you can do this in a straightforward manner. The recovery key is a 256 bit key printed in the form of 24 words. It can be used to recover your account should you forget your passphrase. 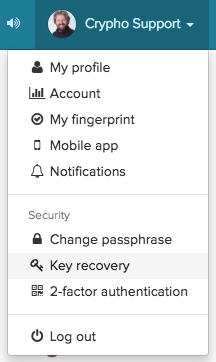 The new recovery key will only be shown to you once. There is no way to access it again. We recommend that you write it down or print it on paper. Store your key in a safe place, for example in an envelope in a safe or bank deposit box. Do not store it digitally. And make sure no-one else gets access to it.